The drive from Carnforth to Grasmere is such a pleasure. I went up the A6 through the little market town of Milnthorpe, past the ancient topiary gardens at Levens Hall and on to the A591 past Kendal. As you dip down to the Crook roundabout you get to your first really good view of the Lake District fells. It always lifts my heart and reminds me why I live in this part of the world. 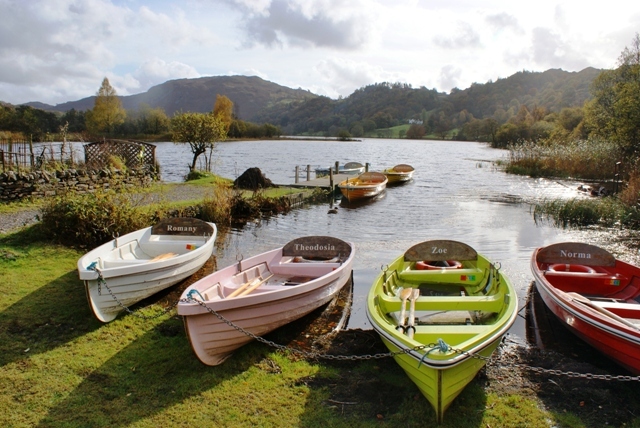 Then it was on towards Windermere, along the lakeshore, past the long, white frontage of the Low Wood Bay Hotel, beside peaceful Rydal Water and into historic Grasmere village with its lovely lake. 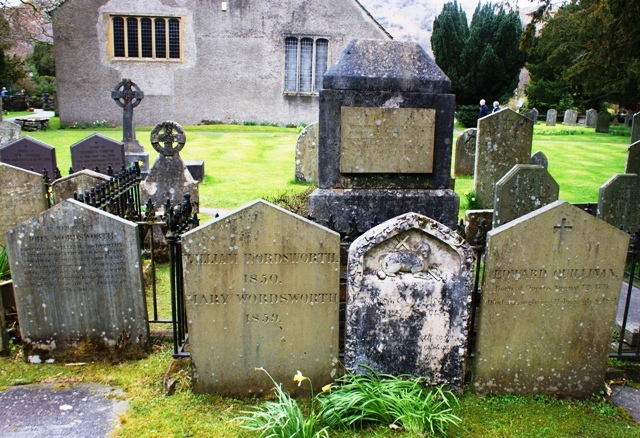 In spring the village blooms into life as a ‘host of golden daffodils’ made famous by local poet, William Wordsworth, seem to be permanently ‘fluttering and dancing in the breeze.’ My first stop was to pay a quick visit to the poet’s family grave in ancient St Oswald’s churchyard. 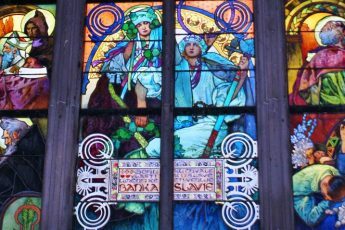 In the summer it is almost impossible to get close to what has become a shrine for visitors from around the world, but this time there was just a solitary American. “Which William is the right one?” he asked, looking over at two old tombstones with the same names … A couple of past-their-best daffodils sagged disconsolately in front of their champion’s simple stone. He then wandered off to visit quaint Dove Cottage and I went into the Wordsworth Daffodil Garden. 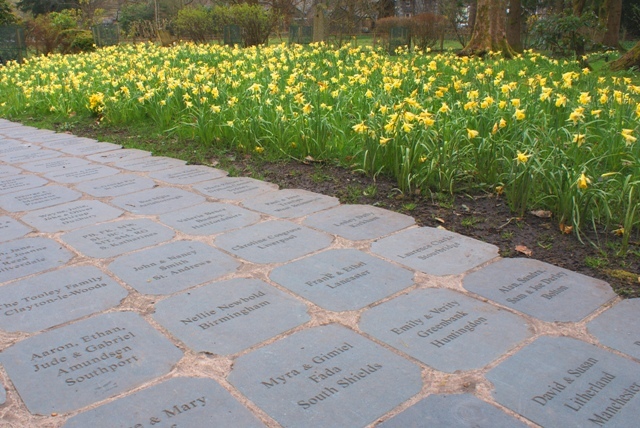 Here many people have sponsored a personally engraved slate paving stone, a shrub, or a wild daffodil and there’s an air of peace and tranquility that the poet laureate would have very much appreciated. Sitting on a wooden bench it was a joy to listen to the River Rothay burbling away under the stone bridge, the ducks quacking as they started house-building for their forthcoming families and the many birds singing their little hearts out in the spring sunshine. Opposite St Olaf’s, next to the cottage of world-renowned Story-Teller Taffy Thomas, is the National Trust shop in an old house called Church Stile. I popped in to see Chris Shaw, who’s a mine of information on Grasmere and the surrounding area. She suggested I go up the road to visit Allan Bank, one of the National Trust’s latest properties to open to the public, where I could enjoy the views and get a free cup of coffee. After a quick look round the shop, picking up a few information leaflets, I walked through village and up the short hill to the large cream house overlooking the lake. Allan Bank has a fascinating history; Wordsworth lived here, as did co-founder of the National Trust, Canon Rawnsley who left it to the Trust. Badly burned in a fire in 2011, it was finally opened to the public in 2012. The wonderful thing is, the NT have left it virtually undecorated but created unique spaces where children can play, artists can create and everyone can enjoy a unique atmosphere that seems to positively force visitors to slow down and relax. Dave Almond explained some of the work being done at present – the gardens are being restored and the public are being consulted at all times to ensure Allan Bank doesn’t lose its special appeal. 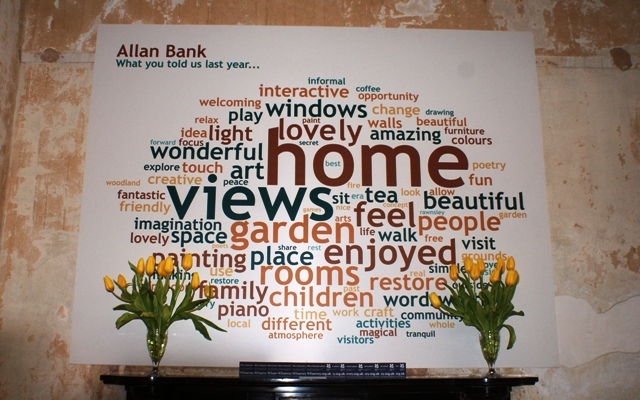 The enormous Tweetcloud above the entrance hall fireplace sums up the feelings this charming place evokes. The views across to Grasmere are unrivalled any time of year. 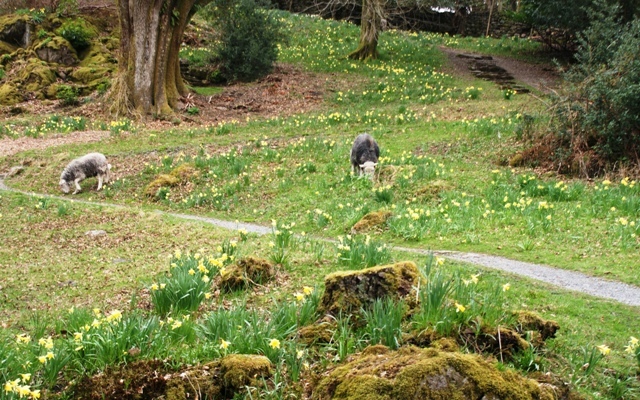 The final stop of the day was Dora’s Field in nearby Rydal. 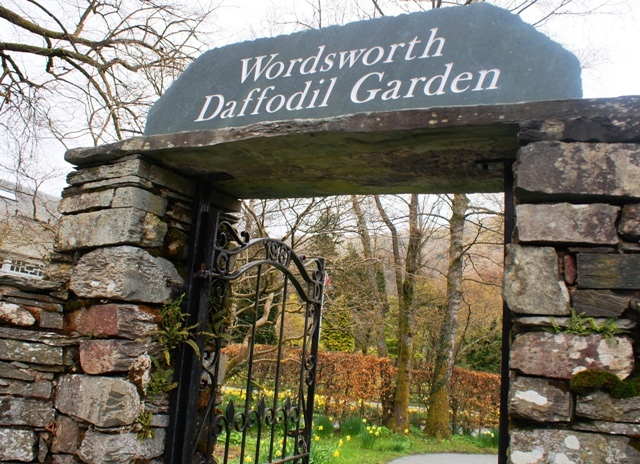 When Wordsworth’s daughter Dora died in 1847, the poet was devastated. 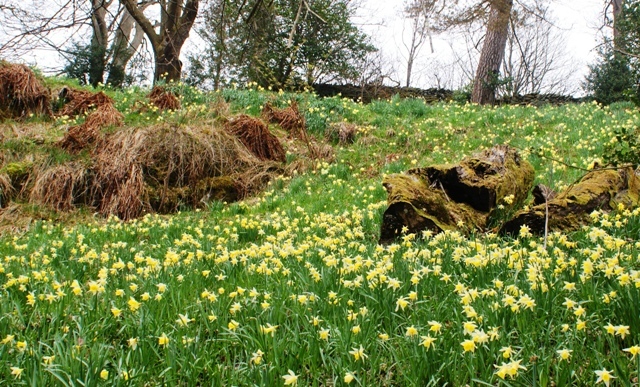 He’d given her this plot of land near to his home, Rydal Mount, and in memory of her he planted thousands of daffodils – the tiny ones often found in woods and beside lakes. Every spring they produce a glorious display. And there, chomping away on stubby grass (and possibly the daffs) were a couple of other lakeland favourites, Herdwick Sheep. These study animals are bred to survive the Cumbrian climate and high fells; they have thick, dark, wiry wool and smiley white faces. It certainly looks like you had a lovely day out. 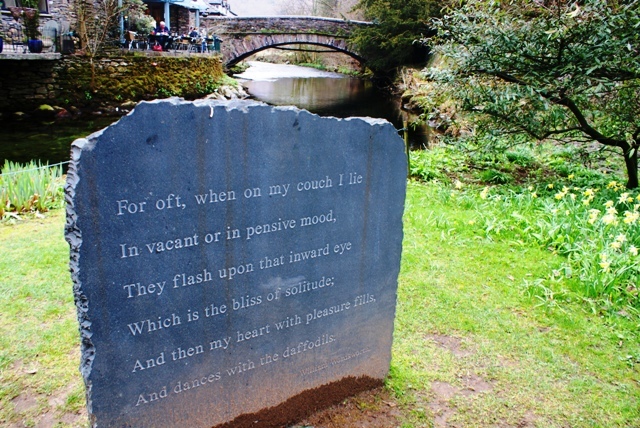 And in the footsteps of one of our great poets. Thanks Lynne – as you say, the Lake District is a very photogenic place, tho a bit of challenge in our weather sometimes!